This is another holiday themed reimagining that didn't require much imagination. The MWM portion of the Ear Headband is already a bow. The only thing needed to be done was to liberate it from the headset and attach it to a wreath. Of course, this makes this hack slightly destructive. But it's not too bad. 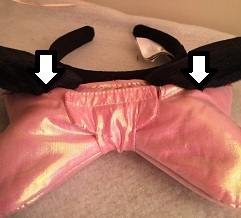 The bow part of the headband is sewn onto the ear portion in three places. One attachment is near the bottom. The other two are on the back, The arrows on the these pics show the places where the attachments may be found. Carefully cutting those threads will release the bow from the headset. To restore the setup to it's initial state simply requires using some black thread to sew the bow back onto the ear headset, attaching at the same points that were cut to release it. Pretty minimal. 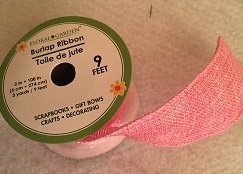 I found some burlap ribbon in the floral section of Dollar Tree that fairly closely matches the color of the bow fabric. Close enough. That's what I used to tie the MWM bow onto the wreath. The diameter of the wreath is 22". Not sure I'd want a wreath any larger or the 'bow' might begin to look proportionally undersized. As getting the wreath mounted on the hook on the wall is always a bit of an adventure, I made sure that the bow was hooked up for external power before placing it on that wall. Setting that up proved to be another adventure. The battery compartment of the bow has a rather small opening. The battery contacts are recessed and not easily accessible. I ended up going with a dowel-dummy battery arrangement. Even then, I had to adjust the placements several times to get it to connect successfully. But once the inserts were working, they continued to do so throughout the holiday. 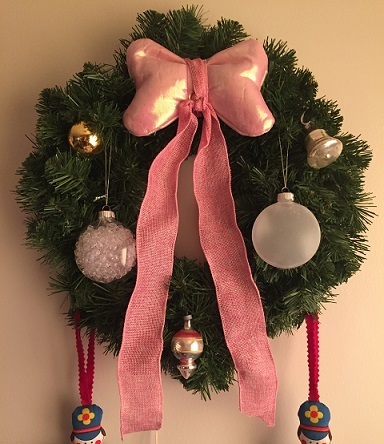 All that remained to do was to use the ribbon to tie the Bow onto the wreath and connect the wires to the power supply. If an external battery holder was used, it could easily be hidden behind the wreath and give a slightly cleaner look without the dangling wires. In practice, the wires didn't really detract much from the effect as the setup usually ran when the room lighting was low and the wires harder to see. The bow and ribbon could just as easily be applied to a large package, large stuffed animal, etc. 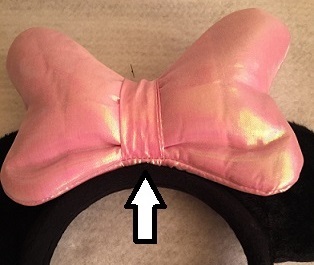 And, of course, sewn back onto the ear headband when heading back to the parks.